See the vintage cuties in the photo above? They’re the reason the sew-along patterns are going to stay posted (rather than reappearing in my etsy shop) and you’ll have an unprecedented EXTRA MONTH to get your sewing done because I’m feeling generous due to generosity toward me. Here’s the deal: If you’ve been sewing along and posting your pix here you can enter your links to your photos by July 5 here and get a free pattern for Betsy’s dog, Nosy, which will be sent out July 6. If you miss that deadline, you can enter until July 31 on this form and you will get your Nosy pattern Aug 1.
and some that she made friends with. 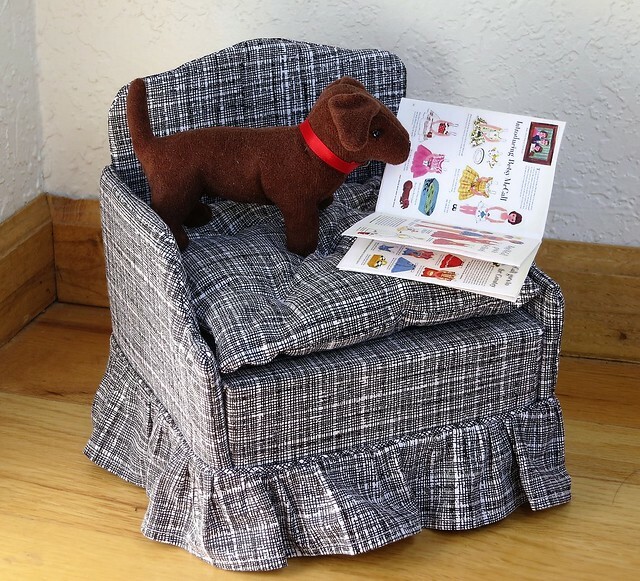 It’s a chair based on a McCall’s pattern for Ginny/Tiny Betsy but enlarged and adapted to fit 14″-15″ dolls. Enter your links to your photos by July 5 here and get a free pattern for Betsy’s dog, Nosy, which will be sent out July 6. Now that the sew-along is over what will be appearing? Cuteness! Different sizes! Since I took May off from blogging (but not sewing) there’s a bit of a backlog that may appear as a post a day of mix/match patterns in AG size that you will love! After that, there are some totally adorable felt Lottie accessory projects, (definitely appearing) followed (almost certainly) by Lottie clothes and then I’m toying with several ideas for an easy (maybe foam core?) house for 8” dolls since that is a sadly neglected scale. The only issue there is what style could suit all my dolls of that size from the Lotties with their different interests, (Fairy? Hanok? Science lab? Tent? Hogwarts?) to Betsy and Ginny, who’d clearly prefer a mid-century one with their original McCall’s cardboard/fabric furniture. That will take us about up to August and back to school/work and feverishly working on a new pattern collection. If you’re like me and counting down the days until August 24, (56 more days!) you might be able to guess what the next collection will be! This week’s dress is from the same set of paperdolls as the week 1 swimsuit. Betsy wore it to travel to visit a friend. Pleats and plaid/checks just seem to go so well together, but you could easily change this up by using a cute print or making the skirt gathered instead. One more day and we will be home! I’m very hopeful our house-sitter didn’t have any parties, or least cleaned up from them well 🙂 and that you’ve had fun sewing and posted your pix here: https://www.flickr.com/groups/2825314@N20/ so I can have fun seeing them as soon as we’re back! It makes me kind of sad to not be sharing awesome versions of everyone else’s outfits here, but even if you’re not participating, please check out the flickr link above to see other creative versions of these patterns! In the same set of paperdolls from last week is what I’m going to call “flower garden” dresses. The instructions are for the tulip one, but you could get inspired to do all sorts of amazingly creative floral things! Reminder: your comments go to my email first and don’t show up until they’re moderated so if you do post one, I won’t see it and it won’t show up until I’m back from vacation. 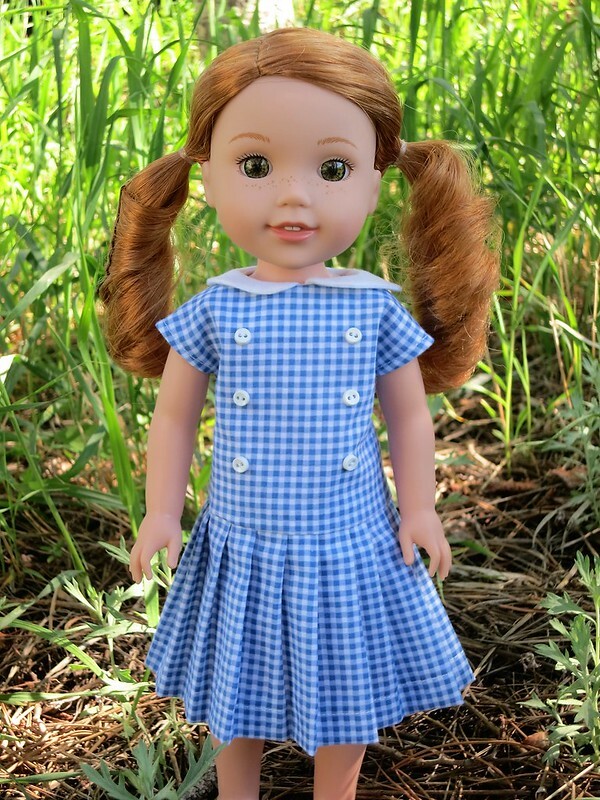 A super-long post with lots of dollie updates but feel free to scroll past it all to the bottom for this week’s sew-along pattern! As I mentioned last week, our “Betsy paper doll” SSA will run the whole month of June this year, and I’m setting up automated posts to appear for the two weeks I’ll be gone, but won’t be able to see your flickr pix or respond to comments and my etsy shop will be closed during that time too. I’ll leave all the patterns up for the duration of the sew along, and then they may transfer over to my etsy shop. If you sew all the outfits and post your pix on Flickr by the end, you can get a bonus pattern for Nosy! More info when the deadline approaches. Where are we going? Korea! And now, let’s talk about Lottie. They’re related in a VERY roundabout way 😊 So, I’ve mentioned her a few times on the blog but haven’t had one of my own until recently, but now have a whole bunch. Let me explain… I got the book below because all my “international” doll mooks so far came from Japan. This one, published in March, 2017 was the first Korean doll mook I’ve seen that is not just a translation of a Japanese one, but actually features Korean dolls and designers. Even though it was expensive with shipping, I wanted to get it also to encourage more of these types of books to appear. This isn’t a book review but…the book is OK. Maybe not worth the high price I paid when shipping is factored in, mainly because there are scant instructions/patterns to actually make the cutest things they show but it does have lots of nice color photos for inspiration. Most disappointing was the part called “Furniture for my doll” that has no furniture, just a tutorial about putting two squares of ?wood? together and covering them with wallpaper to make a backdrop. 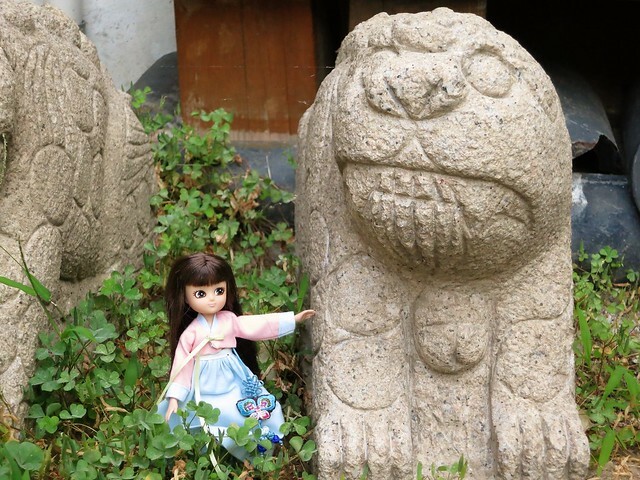 ☹ Anyway, it’s full of really cute dolls about 7-8” tall that cost hundreds of dollars if you can even find them outside of Korea with some extremely basic patterns that I (although probably not everyone) could have drafted in a fairly short time. 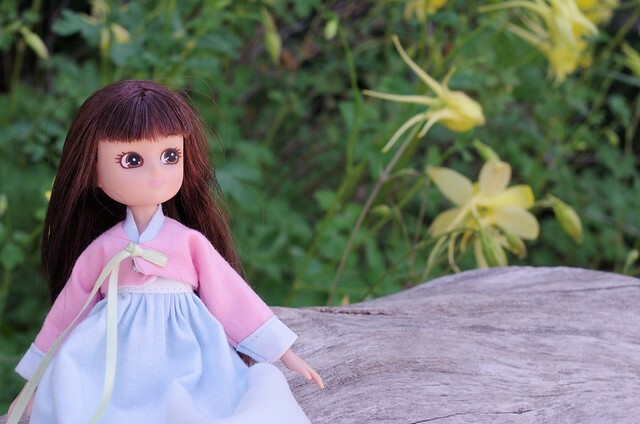 Oh darn, this is turning into a book review… If you have these dolls and speak/read Korean and have limited sewing knowledge, this is the book to get. If you’d like to know what’s trending as far as small doll clothes/settings in Korea and want a lot of inspirational photos to inspire you to create your own woodworking plans and embroidery patterns for all the cute little felt things, this is also the book for you. OK, so how does this relate to Lottie? I figured she might be about the size of the dolls in the book, which is correct-ish. She’s the same height, but has a child body instead of the mature bodies of the book’s dolls. My toy store (Grandrabbit’s in Boulder) had a large display of them, and I grabbed “Forest Friend” mainly because of a) red hair and b) super cute packaging. And then I did a post (no, you didn’t miss it, it just hasn’t appeared yet) on making little stuffed forest friends for her, because compared to the rest of them, Forest Friend is pretty lacking in the outfit/accessory department. Other dolls come with multi-part outfits, for example, “School Days” comes with glasses, blouse, skirt, socks, shoes, scarf, backpack, leadership cards. Forest friends comes with a dress, shoes and headband for the same price. The back of the box instructs you to collect them all, and I’m doing my best 😉. Their website also found me a new toy store I was unaware of (Jake’s Toy Box if you live near Arvada) with a super-friendly staff, some Lottie stuff in the clearance section and a deal on a Fossil Hunter Lottie! That was a great day! Check out the cute detailing on the soles of her shoes! DH was also having fun trying to do what’s called “forced perspective” with her. If you’ve seen the special features of the Lord of the Rings movies, you might know how they play with placing things in relation to the camera to cause them to look bigger/smaller. If you place tiny Lottie super close to the camera, it’s possible to make it look like she’s more life-size. That’s a triceratops skull in the background; they are about 4m tall when “fully assembled”. and have other amazing adventures! 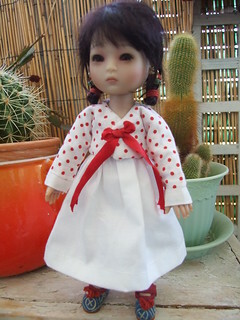 So, feeling like I needed a little travel doll for our vacation, I headed back to Grandrabbit’s to get a “School Days” Lottie intending to make her a hanbok and take pix of her all over Korea. Sadly, there was an issue with that doll, (dents in her face caused by her glasses being on too tight) but when I contacted the company, they were very nice about it, and fixed the problem immediately. 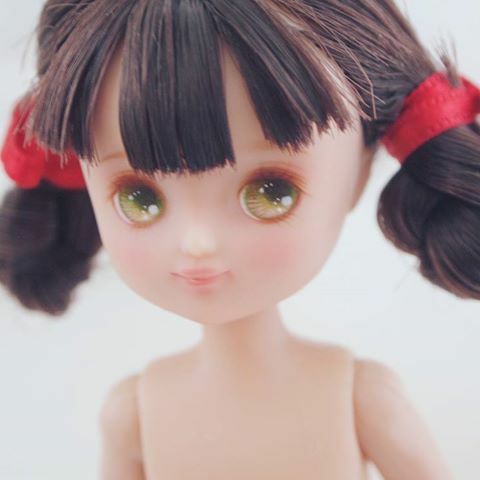 Lottie has GREAT customer service compared to a lot of other doll companies out there right now, some of which can be a nightmare to deal with (cough, ruby red galleria). I took the color scheme from a hanbok, whose picture I unfortunately can’t find right now and came up with Betsy’s dress – inspired by Mondrian, who ?maybe? got some inspiration from bojagi and now the circle closes and Betsy’s Mondrian dress goes bojagi 😊 Of course you can make it the original way too! Our craft for this week is a mid-century table, because who doesn’t love mid-century furniture and there’s a serious lack of it out there for 14” dolls! Based on your votes, this year’s summer sew-along will be 1950s dresses for Wellie Wishers inspired by Betsy McCall paperdolls. Being gone for so long, I have about a million things to say, but am running out of time, so will just quickly post this and get to the rest later. The good news is our “Betsy paper doll” SSA will run the whole month of June this year, starting on the first! The good/bad news is I won’t be here for all of it. This year, for the first time in more than 10 years we’re actually taking a vacation! Yay! So, I’m setting up automated posts to appear for the two weeks I’ll be gone, but won’t be able to see your flickr pix or respond to comments and my etsy shop will be closed during that time too. This year, I’ve also hoping to have a 1950s-style craft associated with each week that might anything from a simple papercraft to a woodworking project. 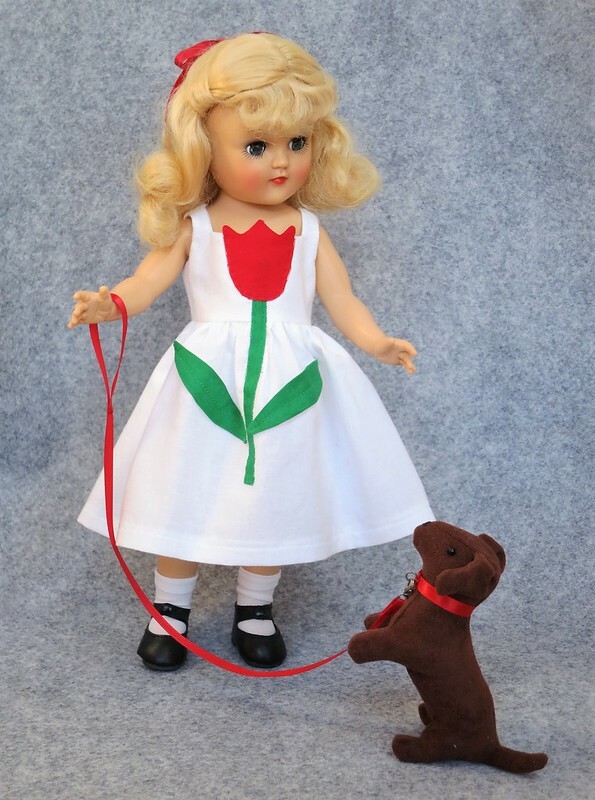 If you finish all the weeks you can get a bonus sewing pattern, which this year will be for Betsy’s dog, Nosy sized to be a companion for 14” dolls, or maybe a mini dachshund for 18” dolls. I did finish him already and he’s super cute!